Currently, David is the Professor of Trumpet and Jazz Studies at Marywood University in Scranton, Pennsylvania and is becoming a household name in the trumpet community, as well as a leader in innovating jazz education and modern improvisation. After receiving his teaching degree from the Pennsylvania State University and masters in Jazz Studies from the University of New Orleans, he performed throughout the United States and Europe before relocating New Orleans, Louisiana. Now in northeast PA, David teaches students from several public and private schools in the area, but primarily teaches a full trumpet studio of students from the tri-state area and actively recruits students for a competitive studio at Marywood University. 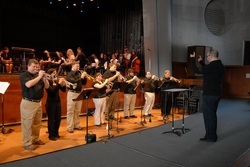 He is also responsible for coordinating the Jazz Minor curriculum and conducting the Marywood University Trumpet Ensemble (MUTE) and Brass Ensemble. David’s students have participated in District, Region and State music festivals, Pennsylvania Intercollegiate Band, and Pennsylvania All-State Jazz Band as well as the All-Eastern Jazz Ensemble. Professor Jumper's students also have an active performing life, giging regularly in the region. Mr. Jumper maintains an active schedule as a guest clinician throughout the northeast. Most recently, David has lead the Connecticut Region Jazz Ensemble at the University of Connecticut, the PA District 6 Jazz Ensemble in Somerset, and the District 9 Jazz Ensemble in Scranton, PA.
David lived and performed throughout New Orleans, in addition to touring Europe and throughout the US with Blues great Walter Washington while pursuing a Masters Degree in Jazz Studies from The University of New Orleans. David performed at the MNOP Jazz Festival in Perigueue, France, the Rochester Jazz Festival, the New Orleans Jazz and Heritage Festival, the French Quarter Festival, and well known venues The House of Blues, Tipitinas, and Snug Harbor. 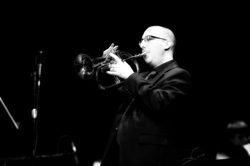 Recently, Jumper performed on the Benny Carter Jazz Festival with Phil Woods and Chris Neville. David Jumper currently resides in Kingston, PA with his wife Tracey, while maintaining an active playing and teaching career.